In 2007 the BBC predicted there would be no more arctic ice by (northern hemisphere) summer 2013. 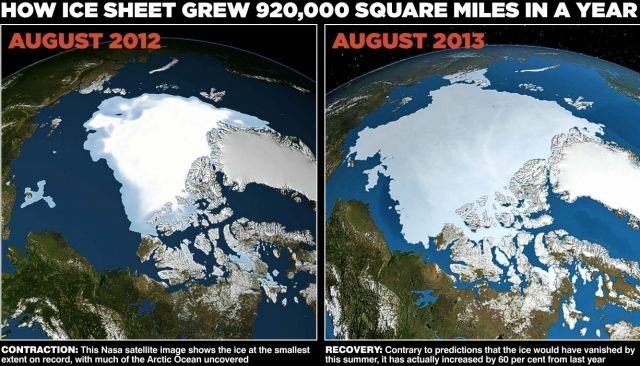 Looks like they were more than wrong its the complete opposite, there is even more ice than in 2012! So in light of the glaring evidence that global warming is not real we should all ask for a carbon tax refund. Of course this would raise the inconvenient question of where did all that money go? The majority of the money went to the same people who engineered the global financial crisis. See how they like things to be global? Feel strange right now? that’s the cognitive dissonance kicking in. Posted on September 10, 2013, in Adam Bandt, Cognitive Dissonance, Consiousness, The Greens, Whistle Blowers and tagged arctic ice, carbon tax, global warming scam, tax refund. Bookmark the permalink. Leave a comment.